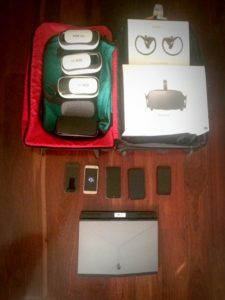 VR in a suitcase – Oculus Rift, mobile VR headsets, phones, Alienware laptop. Not pictured – AKG headphnoes. I was invited to run a short VR session at Northcote High School today. Rolled in with a suitcase full of equipment (Oculus Rift + Touch controllers, mobile VRs loaded with student works from my VR storytelling studio – and extra headphones for good measure), I set up shop at the school’s library. Come event time the crowd started forming around my small table. It was a hit! Students were all extremely excited and wanted to have a go – and at peak time I was struggling with crowd control! Luckily I had some help from two teachers. Students had fun sculpting with the Oculus Medium. Wish I had more time with them to run a full-on workshop or something similar. New Colombo Plan Mobility Grant - Success!